Rom - Ravenclaw. ; he knows his way around machines well, is creative, imaginative and eager. 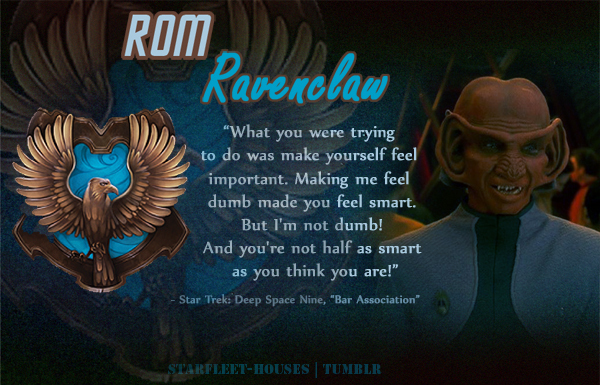 He knows how to be a Ferengi, despite what his brother might say - finances might not be his forte, but technological workarounds, getting to the hearts of his clientele.... Wallpaper and background images in the estrella Trek: Deep el espacio Nine club tagged: deep space nine star trek ds9 rom trek meets hogwarts ravenclaw ferengi. This estrella Trek: Deep el espacio Nine fan art contains signo, cartel, texto, pizarra, and letrero. There might also be animado, cómic, manga, historieta, anime, and dibujos animados.